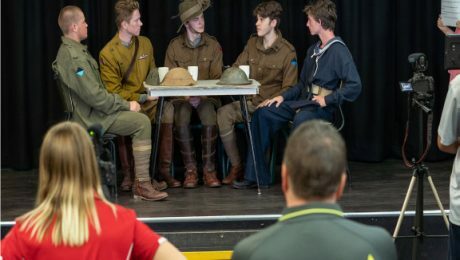 The sacrifice and selflessness of our Anzacs isn’t forgotten amongst the local younger generation with students from Nerang State High School gearing up for another theatrical performance, telling the story of the Spirit of the Anzac, to be shown at this year’s dawn service. Preparations for this year’s video are ‘bigger and better’ than ever before with student participation and efforts at a record high. The captivating visuals and performance have become well and truly entrenched in Nerang’s service and the students’ respect and acknowledgement deepens each year. The Nerang RSL Sub Branch and Nerang RSL Memorial Club prides itself on honouring tradition while also incorporating engaging technology to connect, educate and inspire the younger generation. With 2018 having marked the Final year of the Anzac Centenary, veteran and Nerang RSL and Memorial Club Sub Branch committee member, Mark Swain, said the production is a special way of highlighting the centennial anniversary of World War One (WW1) and ensuing battles and conflicts, to the declaration of the Second World War (WW11) in 1939. “Students from Nerang State High School have been involved in Nerang RSL Sub Branch and Nerang RSL Memorial Club’s Anzac Day commemorations for the past few years and it’s heartening to see the students continue to be a part of sharing the stories behind the events that have shaped our nation and people,” he said. “The students led the lights, camera, and action on the production which begins with a small group of veterans of the war, played by students, sitting in a cafe and sharing their experiences as veterans and how they navigated the war and survived. “The story will not only provide insight into Australia’s involvement in WW1 but also aspects including the partition of soldiers, the homecoming, the Great Depression, Hitler coming into power and all the major battles, conflicts and campaigns of the Western Front as well as events of the Middle East. The production, which was filmed in March, has provided an opportunity for more students to be involved in Nerang RSL and Memorial Club’s Anzac Day commemorations. “Students were able to get involved not only in front of the cameras but also behind the scenes with filming and audio, to all-things editing,” said Mark. President of Nerang RSL Sub Branch, Stewart McGettigan, says it is humbling to see the community gather each year to pay respects to those who made the ultimate sacrifice. “The Nerang RSL Sub Branch and Nerang RSL Memorial Club’s Anzac Day Service is renowned as one of our largest and most respected events of the year, and attracts people from as far as South-East Queensland,” he said. Nerang RSL Sub Branch and Nerang RSL Memorial Club’s Dawn Service will commence at 4.45am followed by an Anzac Day March at 9.40am and the main service at 10am. Nerang RSL and Memorial Club would like to congratulate member, Neville Thomas, who was named Sports Person of the Year for 2018 at the club’s AGM held on Sunday 17th February. Neville, a long time member of Nerang RSL Social Golf Club, regularly volunteers his time to the Golf Club and is an all round supporter of Nerang RSL. and is a well-deserving recipient of Sports Person of the Year for 2018.
were included in Neville’s nomination for Sports Person of the Year,” he said. “Neville volunteers his own time at each game, and afterwards, as the club’s handicapper which can often be time consuming. He keeps track of everyone’s scores and supplies his own books, folders and pens to get the job done without complaint…except of those he receives from players who get their handicap cut down when they come in with a win and pro-like scoring. It’s all in jest though and he cops it on the chin with a grin. And it’s not just the organisational side of the game that he has a handle on, but also the green itself. Neville never missed a game in 2018 and was awarded two trophies at the Golf Club’s end of year presentations. “Neville didn’t miss one game in 2018, attended our end of year trip away and was awarded two trophies, one for the most points scored over the year for A Grade and another for the most ‘longest drives’ recorded in 2018, at our end of year presentations which are scored and decided by the club president,” said Ben. Nerang RSL would also like to congratulate Sylvia Cope who was nominated by the Nerang RSL Swimming Club for her swimming achievements, determination and spirit as well as senior coordinator and foundation member of the Nerang RSL Netball Club, Eden Crabtree, who was nominated for her loyalty, commitment and dedication to coaching, playing and umpiring at Nerang RSL Netball Club. The Nerang RSL Sub Branch has expanded its welfare services, on the back of a grant from the Department of Veterans’ Affairs, Veteran and Community Grants Program, and welcomed a new set of wheels! The Nerang RSL Sub Branch van, an LDV G10 People Mover, is equipped with nine seats and a spacious interior for extra ease and comfort for its guests. Nerang RSL Sub Branch Secretary, David Barnicoat, says the Sub Branch is extremely grateful for the vehicle which will be used to assist veterans and their families. 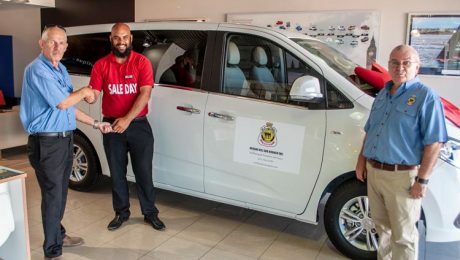 “The Sub Branch is very thankful for the grant received which has greatly assisted us in the purchase of this new vehicle and has enabled the Sub Branch to expand our services for veterans and the local community,” said David. “The vehicle is used to assist veterans who might require some additional help or don’t have access to the required facilities to get to places they need to be. David says the vehicle is a welcomed addition to the Sub Branch, particularly with the new year ahead and plans for the Sub Branch to expand its support network. “One of the key objectives of the Sub Branch is to continue to support veterans and their families and deliver on our commitments, while also being in a position to help out further in the community. For more information, please contact the Sub Branch at Nerang RSL. Get To Know The Man Behind The Legend, held at the Nerang RSL and Memorial Club in support of the Men of League Foundation, will return next month to see the local community gather with mateship and compassion over a BBQ, bevvies and all things footy! The Men of League Foundation provides support to those involved in the mighty game of Rugby League at any level. Whether players, coaches and referee officials or administrators, club volunteers and beyond, the foundation provides assistance to those who have fallen on challenging times and require support from their own. Nerang RSL and Memorial Club has been involved with the foundation for over six years and RSL Board Member – and footy fanatic, coach of league referees and the night’s official emcee – Lloyd Evans, says Nerang RSL is pleased to continue supporting the initiative. “Within Rugby League or any part of the community, there is always going to be someone who is facing a hard time and requires help whether financial, emotional, medical or another type of assistance,” said Lloyd. 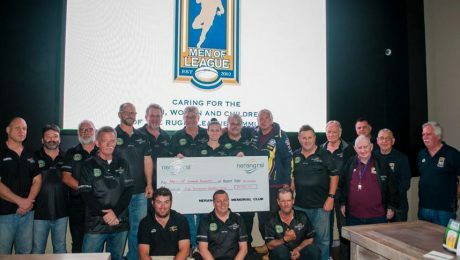 “Nerang RSL is honoured to be able to do its part in supporting fantastic initiatives like Men of League so that the foundation can continue to help change lives. “To date Nerang RSL has donated around $30,000 through its Punters’ Club, footy tipping, the NRL Calcutta, raffles and donations raised at our annual Men of League nights. The night has previously attracted footy stars including Tom­my Raudonikis OAM, Ben Hannant and Chris Lawler and this year will see ex Kangaroos and Manly Sea Eagles player and past coach of South Sydney Rabbitohs, Steve Martin, take to the microphone. Aptly named ‘Get To Know The Man Behind The Legend,’ Lloyd says the event allows the community to do just that, with plenty of snags and bevvies to go around. 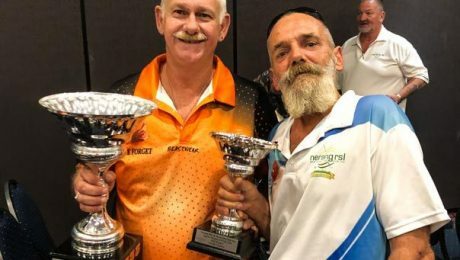 “The purpose of Nerang RSL’s Get To Know The Man Behind The Legend is to raise a dollar for Men of League in a way that the community can enjoy themselves,” said Lloyd. “People generally have an idea of what players have done throughout their career and what they’ve achieved, but often times we don’t know how they got there, about their families or events that made them who they are today. “It’s an opportunity to get to know the player beyond the footy field and in the past our speakers have really opened up and we’ve been able to learn so much about them. It’s great to see the players often stick around to chat to the community and mingle with the members over a BBQ put on by the RSL. 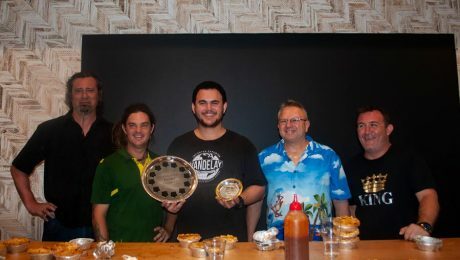 Nerang RSL’s official Pig Out Pie Eating Contest made its debut over the Australia Day weekend and local pie fanatic, Chad ‘Froman’ Jones, put on a champion show to secure the top spot in the contest, now set to be held annually at the club. The competition saw five entrants battle it out to see who could consume six pies or be the first to finish all six of their pies – in just six minutes. With a crowd of onlookers and supporters, pies were demolished by the minute and it was Chad, 26, who managed to scoff all six pies in an astounding two minutes and 13 seconds – with room for dessert afterward. Chad, who has competed in a number of eating competitions across the country, says he couldn’t look past the opportunity to get involved in Nerang RSL’s Pig Out Pie Eating Contest. “My friends tagged me in a post for the Pig Out Pie Eating Contest on Facebook so I messaged Ben at the RSL to confirm there was a place in the contest and what the rules were and it went from there,” he said. “I went into the contest feeling quite confident and had done a couple of practice runs in the lead-up, which involved timing myself and trialing different techniques so that I could stick to the fastest tactic for the contest. “I was focussed on eating the pies as fast as I could and although they were quite hot, I didn’t let it phase me and kept on powering through. Capacity wise it was easy and I ended up having dessert afterward,” he laughed. “It is pretty awesome to have a pie named after me. I’ve won a few eating competitions before, but I’ve never had food named after me,” said Chad. “Nerang RSL’s Pig Out Pie Eating Contest is my favourite eating contest I’ve done so far because the crowd was like no other. Everyone was cheering us on and it was a really great atmosphere to be part of.